Ivanka Trump's brand is disappearing from Nordstrom stores, but the retailer insists it's not because of politics. 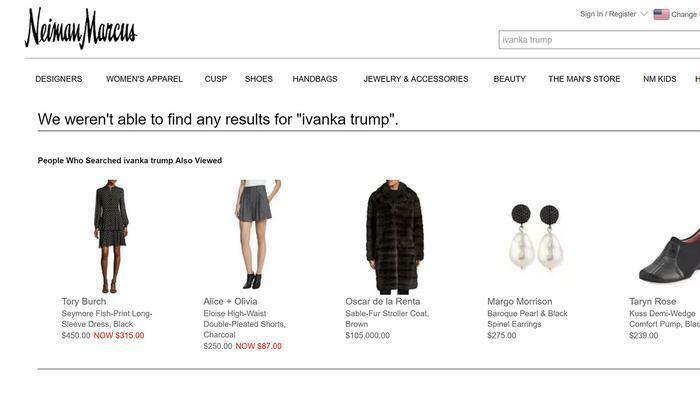 It's also being reported that Ivanka's products are being removed from the Neiman Marcus website. "We've said all along we make buying decisions based on performance," Nordstrom said in response to a report by Racked.com that Ivanka's dresses, shoes, and other apparel were on the way out. "In this case, based on the brand's performance, we've decided not to buy it for this season," the statement concluded. Nordstrom noted it offers thousands of brands in its stores and on its site and cuts about ten percent each year depending on how they perform. The New York Times said a spokesman for the brand disputed Nordstrom's claim that it has not bought any of Ivanka's spring line. But a quick check of the Nordstrom site found only a few pairs of Ivanka Trump shoes. Nothing was found on the Neiman Marcus site. While slumping sales may indeed be a part of the decision, it's worth noting that the Ivanka Trump brand is prominently featured on the boycott list of Grab Your Wallet, a consumer campaign that is asking shoppers not to buy Ivanka or Donald Trump brands. “I am absolutely thrilled, and I know the vast majority of Grab Your Wallet participants will be as well,” said Shannon Coulter, a co-founder of the campaign, according to Racked. Macy's, Lord & Taylor, and other retailers are still selling Ivanka Trump products. Macy's is offering 15% off on products sold before Valentine's Day.